We are delighted to have our article published in the Sunday Business Post on January 21st, 2018. Joe Aherne, founder of the industry training company Leading Edge Group, has established a new company offering outsourced managerial expertise to companies in Ireland. 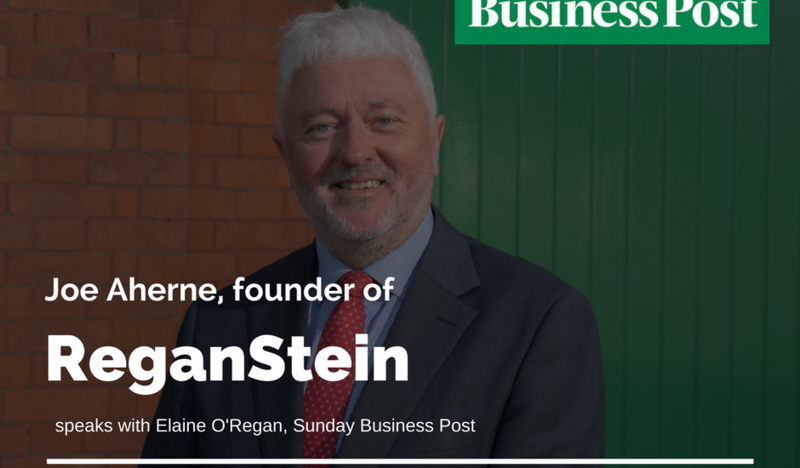 Aherne’s ReganStein start-up will offer management specialists to companies for short-term projects and part-time roles. “There are a lot of retired and semi-retired people in the marketplace with fantastic expertise and, equally, a lot of professional women and men who stepped away from their careers for family reasons and now want to step back in,” said Aherne. “A lot of these people are not interested in returning to full-time employment. They have had successful careers and they want flexibility and work-life balance. He has assembled a panel of 20 professionals with mid-level and senior management experience in sales and marketing, business analysis, market research, operational and change management roles. IT, digital media and project management will also be covered, with fees starting at €650 per day. “We are taking a good long look at the sectoral experience and skillsets we need and we have identified up to 50 professionals we would like to work with. “There’s a long onboarding process involved. It has to work for them as well as us,” said Aherne. “The strategy is to have ReganStein become an international brand, following the same trajectory as Leading Edge Group.” Established in 1995 by Aherne, Leading Edge partners with academic and professional bodies to provide certified training programmes using Lean, Six Sigma and supply chain management principles. The company has a presence in Canada, where it has had an office in Toronto since 2009 and entered the Australian market in 2011. “With ReganStein, one focus will be ‘the lonely CEO’. It’s something I encountered myself in the recession,” said Aherne. “When the property crash came, we were really only concentrating on the Irish market. I really didn’t have any advisors or mentors at the time. It was a pretty lonely place to be. “In the last few months, I’ve been speaking to the owners, not just of start-ups, but established SMEs who have been in the business a few years. You can download the article here: Sunday Business Post 21 Jan 2018. You can sign up to receive our monthly newsletter straight to your inbox via this link.